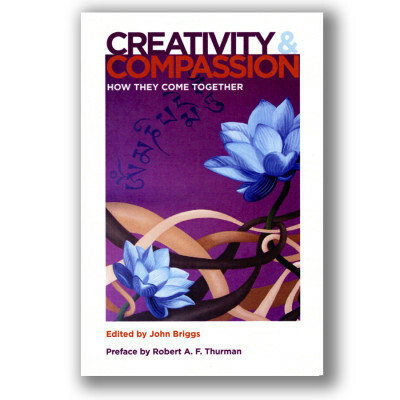 A collection of original essays by Buddhist scholars, educators and creative artists exploring the intersection of compassion and creativity, with an introduction by Tibetan Buddhist Scholar Robert Thurman. Topics include: What do the words compassion and creativity mean? How are creativity and compassion interrelated? Is compassion a creative process? How is compassion present in both the experience of art and the creative process of making art? Are creativity and compassion both present in the highest achievements of diverse fields—from medicine to poetry? are there ways in which creativity and compassion may be applied in daily life, professional fields, and collective action? From the General Introduction to Creativity & Compassion. In the West creativity has long been a vital concept, with largely positive overtones. At the same time, the concept engenders considerable popular ambivalence and confusion. On the one hand, creativity is considered frivolous so that arts programs are the first to be cut in a budget crisis. On the other hand, creativity and innovation are considered essential economic assets. Creativity is considered a healthy means of “self expression.” But creativity is also associated with being willfully nonconformist and with the narcissistic aspect of personality, as in the popular expression disparaging someone for “just being creative.” We depend on creativity to solve problems and yet creativity is often thought of as a little “crazy,” and people involved in sustained creative activities are regularly assumed to be psychologically unbalanced. Though this stereotype is demonstrably untrue, it is persistent and no doubt derives from the fact that creative activity breaks molds and allows people to “think outside the box.” That, of course, is just what people are also urged to do—think outside the box and outside the routines of thought, the clichés of opinion and solution. We feel ambivalent, though. We’re afraid because such thinking seems uncomfortably abnormal. Creativity brings something new or re-newed to the world. It connects the previously unconnected or rejuvenates previous connections injecting them with new vitality as if they are being freshly discovered. Creativity is an immensely powerful human capability. It is the source of change in the world that is made and understood by human consciousness. It’s generally recognized that insight is a form of creativity, as in “The Buddha had the insight about the nature of reality.” Examples of creativity include invention of new technology, discovery of new scientific truths, making works of art that express the renewed spirit, creativity in nature as the evolution of new forms and behaviors, insights in human thought that dispel ignorance or illusion. Humans are creative animals. We invented clothing, fire, religion, mathematics, language, culture itself. The sustained creativity that has produced the great music, visual art and literature of the world shows the connection between creativity and compassion. These great creative works elicit our recognition of the human condition. Without saying so directly, they evoke our compassion for human suffering and for our sense of identity with every thing and everyone. The kind of creativity expressed in the arts puts us in touch with this sense of universal connection that is impersonal and yet passionate; art shows that our deepest connection to the world is not based on attachment.